‘...he said if he did not control me I would go off with other men and this was a way to control me.’ (Siddique et al, 2008, p146-147). ‘My husband treated me badly and I just used to tolerate it because I used to think when I got married, I believed... if you spend a life with someone you have to make some sacrifices.’ (Siddique et al, 2008, p146-147). Ayesha is an older British Asian woman who has some physical health concerns. She is a widow and lives with her son, Bilal. There are concerns that Ayesha may be experiencing coercive control from Bilal; a pattern which repeats Ayesha’s experience with her husband who is now deceased. This case study considers issues around working with Asian communities, specifically Pakistani Asian women; cultural capability; reflecting on the values and knowledge that we bring to situations, and working with older victims of domestic abuse. Ayesha, 66, was born in Pakistan and came to the UK with her husband, Tariq. She was 18, he was 28. They have four children and seven grandchildren. During their marriage Tariq was physically and verbally abusive to Ayesha and was controlling of her and their children. Ayesha stayed with her husband for the sake of the children and her family’s izzat (honour). Ayesha’s first language is Urdu; she speaks very little English. Tariq did not see a need for her to learn. Tariq died two years ago following a short illness. Bilal, Ayesha’s eldest son, moved in with her after Tariq died. Bilal is widowed and has no children. Bilal often tells Ayesha how lucky she is to have a devout son who has come home to look after his mother. Bilal uses the whole house, apart from her bedroom, as his own. Bilal often yells at her and Ayesha feels in his way in the lounge especially if he is watching television with his friends. She spends most of her time in her bedroom. Bilal collects Ayesha’s pension and does the food shopping on a weekly basis. He says she deserves to rest, not carry heavy bags on the bus. Ayesha used to enjoy cooking but now she gets stressed in case a meal doesn’t please him. Sometimes he wants a full meal cooked quickly for his friends. Ayesha is often tearful and is very tired all the time. She has lost weight and is not sleeping. She finds it hard even to pray. This upsets Ayesha as her faith is important to her. Normally the family visit monthly at the weekend. Recently her daughter Amnam, came to visit unexpectedly. She is worried that Ayesha is having problems with taking care of herself. She says Ayesha needs help to keep clean, wash her clothes and she thinks Ayesha is avoiding drinking too much because getting to the bathroom is difficult for her. Amnam wants Ayesha to have a social care assessment, so that she can have help with personal care from a woman if she needs it. Amnam convinced Bilal, who agreed, providing he could interpret for her. A social worker, Marhaid, comes to the house with Ali, a social work student who speaks some Urdu. After the meeting Ali convinces Marhaid that Bilal had not been interpreting everything Ayesha said and that they should see Ayesha with a professional interpreter. How would you make safe enquiry with Ayesha? Who will meet with her? How will you contact her to arrange the meeting? What actions would you discuss with Ayesha to ensure her immediate and longer term safety? Muslim Women’s Network UK (MWNUK) explains that Muslim women experience a range of issues related to domestic abuse. 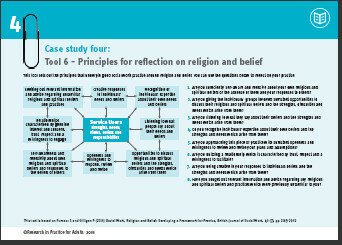 Tool one (below) looks at the principles that underpin good social work practice around religion and belief. You can use the questions in the tool to reflect on your practice. The evidence scope gives more information on issues which affect specific communities, such as so called honour based violence, which is categorised as a type of domestic abuse in the Home Office Statutory Guidance Framework. So called Honour Based Violence (HBV) is an umbrella term to encompass various offences covered by existing legislation, including Forced Marriage and Female Genital Mutilation. HBV can include a collection of behaviours which are used to maintain control within families or other social groups. The risks can be high as there may be many abusers in the extended family or community networks. Other people in the family or community may pressure the victim to return to abusive situations or fail to support them. It is important to understand HBV in the context of violence against women and girls and consider the risks to all women and girls in the family. Another form of abuse alluded to in this case study is domestic servitude. While it is not covered in the coercive control legislation, it is an offence under the Modern Slavery Act 2015. Intersectionality refers to how different aspects of identity are interconnected. Theories of intersectionality explain how identity and consequential experiences of discrimination cannot be examined separately from one another, nor by a simple ‘adding up’ of different aspects of oppression. Rather, multiple dimensions combine to intensify (or reduce) systematic and institutional oppression. You can find out more about intersectionality in slides outlining theories of domestic abuse, and some videos that explore themes of intersectionality are linked to below. Identity is fluid and multi-faceted. People have multiple identities and while some combinations further disempower, other dimensions might privilege individuals and groups, creating a complex pattern of social relations based on inherent advantage or disadvantage. There is significant evidence that people with care and support needs are more vulnerable to domestic (& other forms of) abuse AND less likely to have access to the services and the protection that may be needed. There is a long history of domestic violence, victim blaming and of justifications for the male abuse of women. Alongside gender identity those of religion or belief, race, age, sexual orientation, disability and other dimensions of oppression are also important. When several of these interconnect unfavourably in a person’s identity – the person becomes more vulnerable to abuse. Feminist theories of intersectionality explore the interaction of multiple identities and female subordination. Tool 2 supports reflection on professional knowledge. It outlines a number of reflective questions which can be used with a specific case in mind. These questions can help to clarify unconscious biases and work out what is influencing professional judgements. Campinha-Bacote’s ASKED model of building awareness, skills, knowledge, encounters and a desire to develop cultural competence. Carballeira’s LIVE and LEARN Model whereby practitioners like, inquire of, visit and experience people from different ethnic groups in order to listen, evaluate, acknowledge, recommend and negotiate approaches which are the most culturally acceptable (Carballeira, 1996 in Laird, 2008). Explore these models in Tool 3, below. to help you in routinely gathering feedback to support your ongoing development of cultural capability. Are you sufficiently self-aware and reflexive about your own religious and spiritual beliefs or the absence of them and your responses to others? Are you giving the individuals/ groups involved sufficient opportunities to discuss their religious and spiritual beliefs and the strengths, difficulties and needs which arise from them? Are you listening to what they say about their beliefs and the strengths and needs which arise from them? Do you recognise individuals’ expertise about their own beliefs and the strengths and needs which arise from them? Are you approaching this piece of practice with sufficient openness and willingness to review and revise your plans and assumptions? Are you building a relationship which is characterised by trust, respect and a willingness to facilitate? Are you being creative in your responses to individuals‟ beliefs and the strengths and needs which arise from them? Have you sought out relevant information and advice regarding any religious and spiritual beliefs and practices which were previously unfamiliar to you? 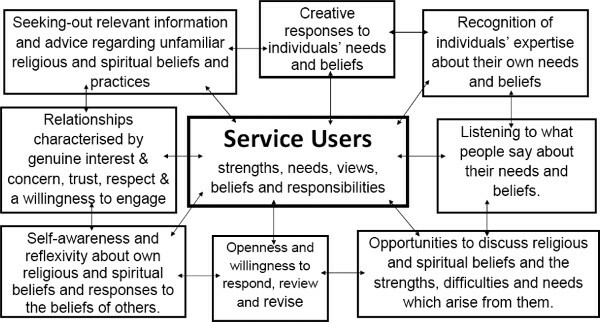 This tool is based on Furness S and Gilligan P (2010) Social Work, Religion and Belief: Developing a Framework for Practice, British Journal of Social Work, 40 (7), pp 2185-2202. What am I taking to be the facts of this situation? Why did I orient to these particular facts rather than others? Would someone whose gender, social location, professional doctrine or culture is different to mine orient differently to this situation? Where did I learn this ‘way of looking’? Whose voice is being exercised in this knowledge? Is it mine, or someone else’s? What are the cultural, gender or epistemic biases implicit in this way of looking? Is my own experience represented in this knowledge? Is there some personal experience which is silenced by this knowledge? Do I recognise myself and my experience in this way of speaking my knowledge? Sellick, M., Delaney, R. and Brownless, K. (2002) ‘The Deconstruction of Professional Knowledge: Accountability without Authority.’ Families in Society Vol. 83(5), pp.493-498. Tool 3: Building Cultural Capability. ‘Assessing Social Work practice against the PCF: Principles for gathering and using feedback from people who use services and those who care for them’. Carballeira’s LIVE and LEARN Model (Carballeira, 1996 in Laird, 2008). This tool outlines a framework for developing cultural capability, seeing this as an essential and ongoing process of good social work practice. Like – develop a liking for work with people from minority communities. Inquire – commit to finding out about diverse ethnic groups. Visit – be a respectful and observant visitor when working with people from other ethnic groups. Listen – observe style used by people from different communities & adopt styles of communication. Acknowledge – identify similarities and differences and any areas of potential conflict with statutory requirements and inform the service user. Recommend – offer service users a range of intervention approaches and consult on which are most culturally acceptable. Negotiate – openly discuss areas of conflict & work towards acceptable compromises. You can use the critical reflection tool and action planning tool to review your ongoing progress in developing cultural capability. You can use the principles of gathering feedback tool to structure how you routinely gather feedback on your practice from people who use services and those who care for them. Also see the diagram below illustrates the stages that people move through in developing cultural competence. Superiority –the practitioner believes that the service-user’s culture is inferior and attempts to impose his or her values and worldview. 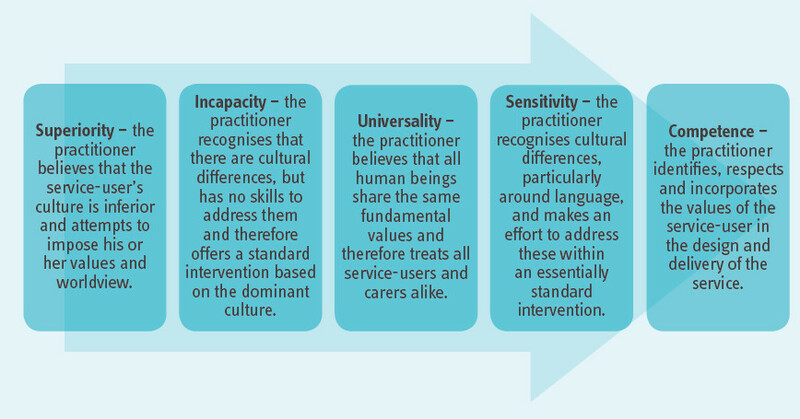 Incapacity – the practitioner recognises that there are cultural differences, but has no skills to address them and therefore offers a standard intervention based on the dominant culture. Universality – the practitioner believes that all human beings share the same fundamental values and therefore treats all service-users and carers alike. Sensitivity – the practitioner recognises cultural differences, particularly around language, and makes an effort to address these within an essentially standard intervention. Competence – the practitioner identifies, respects and incorporates the values of the service-user in the design and delivery of the service. Crenshaw, K (1993) Mapping the margins: intersectionality, identity politics and violence against Women of Color. Stanford Law Review, 43, 1241. McGarry J and Simpson C (2011) Domestic abuse and older women: exploring the opportunities for service development and care delivery. The Journal of Adult Protection, 13, 6, 294-301.